Plugin Alliance offers bx_megadual for $29! Today only, the Plugin Alliance's X-Mas calendar gives you the opportunity to get the Brainworx bx_megadual for $29. 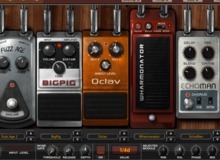 Audified gives you the opportunity to name your own price for their MultiDrive Pedal and Multi Cabinet plugins and offers new bundle at special price. Today's door in Plugin Alliance's X-Mas calendar unveils Brainworx's plugin rendition of the Engl E765 RT guitar amp. Today's X-Mas Calendar offer at Plugin Alliance makes the bx_bassdude amp plugin available at 67% off. Continuing its Metal Month, Toontrack has just released Metal Guitar Gods 3, a new series of guitar and bass settings for EZMix 2.